Jamelle Bouie has a piece on Slate in which he reflects on the year since Michael Brown’s death and how it has changed America. 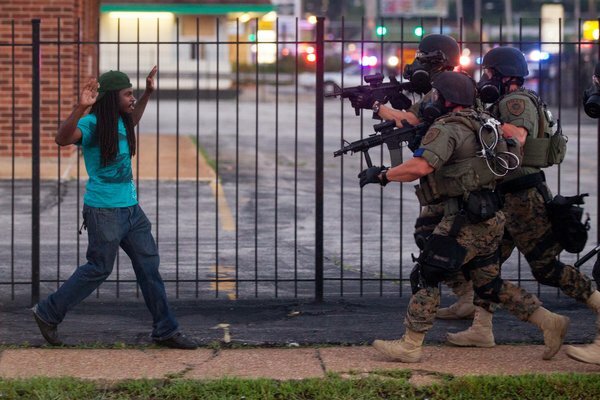 That photo captures a key dynamic in contemporary America: a militarized police force that apparently regards African-Americans as the enemy to be subjugated by means of any force necessary. It’s a photo of White Supremacy and racism exposed for what it is. It’s a photo of our America, an image I can’t get out of my mind because it reveals all of our hypocrisy as well as the evil at the heart of American culture and history. I went back through my blog to look at how I’ve addressed racism over the years. It’s quite telling. Before the release of the Race to Equity report that detailed the horrific racial disparities in Madison and Dane County, there’s a smattering of references to racism on my blog. Since Ferguson, it’s probably the dominant topic. I’ve preached about it, written about, participated in demonstrations. I’ve read more about racism in the last year than I had in the decades since taking a course on African-American history in college. Racism and America’s culture of violence will be a major focus of our programming at Grace in the coming year. If Ferguson was an earthquake—a tectonic shift in our arguments over race and racism—then a year later, we’re not just feeling the aftershocks. We’re preparing for the next blow. Bouie did not mention how Ferguson and #BlackLivesMatter have changed American Christianity and I’m looking forward to reading similar retrospectives from theologians and religious commentators. The real scandal of the gospel is this: humanity’s salvation is revealed in the cross of the condemned criminal Jesus, and humanity’s salvation is available only through our solidarity with the crucified people in our midst. Faith that emerged out of the scandal of the cross is not a faith of intellectuals or elites of any sort. This is the faith of abused and scandalized people—the losers and the down and out. It was this faith that gave blacks the strength and courage to hope, “to keep on keeping on,” …. The cross and the lynching tree interpret each other. Both were public spectacles, shameful events, instruments of punishment reserved for the most despised people in society. Any genuine theology and any genuine preaching of the Christian gospel must be measured against the test of the scandal of the cross and the lynching tree. My reflections on Advent have been profoundly affected this past week by the events in Ferguson and the way the mask of a post-racial America has been ripped off to expose the bitter and deep realities of racism and injustice. I’m not alone. #StayWokeAdvent is a thing. Have you ever been stuck in a dark place with only a sliver of light or no light at all? You know those times waiting for news that could bring just as much struggle as it brings resolution? Remember the times of waiting and waiting, not knowing when the answers will come? Times of anticipation, of unknowing, of darkness before more light, are not always joyful, peaceful, or even largely hopeful. These are times of struggle, times of wrestling, doubting, mourning, crying, yearning, times of staying alert to the signs that light may be coming, that things are changing. This is the time, the time of Advent, to stay alert…to “stay woke”…to your senses, your mind, your body, your feelings, your spirit to where to Spirit is stirring and leaning. Stay woke….to the impact your life has on others…Stay woke…to the injustice that we either contribute to or diminish…Stay woke….to the groanings of the world…Stay woke…to the humble, radical, empire-upsetting ways of Jesus…Stay woke…to the darkness…Stay woke…to the light…and to the sacred and profane in both. But we do the Light a disservice when we underestimate the darkness. Jesus entered a world plagued not only by the darkness of individual pain and sin, but also by the darkness of systemic oppression. Jesus’ people, the Hebrews, were a subjugated people living as exiles in their own land; among other things, they were silenced, targets of police brutality, and exploitatively taxed. They were a people so beaten down by society that only a remnant – most notably Anna and Simeon – continued to believe that the Messianic prophecies would one day come to pass. For many, the darkness of long-standing oppression had extinguished any hope for liberation. The Very Rev. Mike Kinman of Christ Church Cathedral in St. Louis has called on Episcopal Cathedrals (and other churches) to take some time in Advent to address the “he issues Ferguson has raised and where those issues of race, class and the oppression of God’s children are present in your community.” More information on that is here. Grace Church, Madison will be participating. The Washington Post has the story of the church apparently destroyed by arson this week in Ferguson and its pastor’s struggle to understand (Michael Brown, Sr. is a member of the congregation). As we gather at tables, grieving the state of our nation, may we gain spiritual strength for the journey ahead, drawing on the deepest wells of wisdom from those on whose shoulders we stand and the various faith traditions that have fueled their freedom march and continue to energizee ours. In the spirit of Rabbi Abraham Joshua Heschel and Dr. King, may the pioneers of the civil rights movement collaborate with the young leaders in Ferguson, New York City and other cities, and may they impart their knowledge and understanding of nonviolent resistance that is not passive, but is spiritually active with an abiding faith that the universe is on the side of justice, and that, in the end, love will triumph over evil. May this spiritual strength, fueled by prophetic fire and love, reveal to us our neighbors’ humanity, our own complicity in their suffering and liberate us once and for all from the history that continues to enslave us. The radically divergent perspectives on reality of blacks and whites are a straightforward reflection of the radically different realities in which they live. Segregation has deep cognitive consequences as well as the more familiar consequences for one’s chances at a good education, home ownership in good neighborhoods, being able to escape gang violence, etc. That doesn’t mean that black majority opinion is always going to be right, of course. But you would expect that those more subject to the inequities of the system will in general be the ones more likely to have a realistic perspective on it. Whites have not merely an unrepresentative group experience, but a vested group interest in self-deception. Sociologists have documented the remarkable extent to which large numbers of white Americans get the most basic things wrong about their society once race is involved. (See, for some hilarious examples, Eduardo Bonilla-Silva’s “Racism Without Racists.”) My favorite example, from a poll about three years ago, is that a majority of white Americans now believe that whites are the race most likely to be the victims of racial discrimination! If that’s not an epistemology of ignorance at work, I don’t know what would be. What clearly cannot be said is that American society’s affection for nonviolence is notional. What cannot be said is that American society’s admiration for Martin Luther King Jr. increases with distance, that the movement he led was bugged, smeared, harassed, and attacked by the same country that now celebrates him. King had the courage to condemn not merely the violence of blacks, nor the violence of the Klan, but the violence of the American state itself. What clearly cannot be said is that violence and nonviolence are tools, and that violence—like nonviolence—sometimes works. “Property damage and looting impede social progress,” Jonathan Chait wrote Tuesday. He delivered this sentence with unearned authority. Taken together, Property damage and looting have been the most effective tools of social progress for white people in America. It describes everything from enslavement to Jim Crow laws to lynching to red-lining. Read it all. Read it all here.